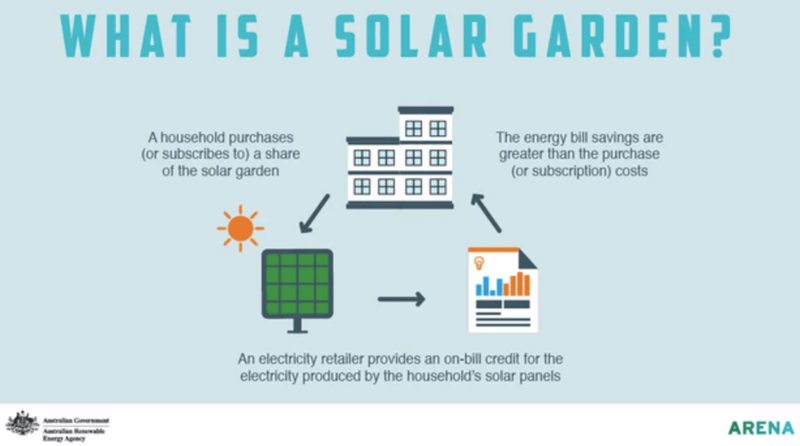 Those unable to get traditional solar systems installed on their roof may wish to take a look at the upcoming solar gardens scheme we will see in Australia. The Australian Renewable Energy Agency (ARENA) are funding a trial of the ‘ground solar’ in (mostly) regional areas of NSW, Queensland and Victoria. According to the Sydney Morning Herald, those without a rooftop who still want to invest in solar power will be in luck if they’re based in Blacktown, Shoalhaven, Byron Bay, Townsville, or Swan Hill – ARENA and ‘other participants’ are providing around $550,000 in funding to assist the trial. “We are trialling solar gardens with the aim of helping renters, low-income households and those living in apartments save on their energy bills,” she said. Specifics on the scheme are still a little thin on the ground (sorry…) but the solar gardens are ‘generally’ under 100kW so as to keep the STCs (small-scale renewable energy generation certificates). The University of Technology Sydney’s Institute for Sustainable Futures and the Community Power Agency will lead this project. Solar gardens are growing faster than any other segment of solar power in the US (200MW of new capacity was rolled out in 2016) – so perhaps this is the start of a revolution where the word ‘solar’ doesn’t necessarily conjure up the image of panels on a roof. I have no doubt we’ll see blockchain technology integrated or, for the bigger gardens such as those at mid-large size apartment blocks, some microgrids available to help balance demand. Are you interested in applying to join the solar garden trial? Watch this space. More info to come as we have it! Burdekin Shire Council have greenlit a massive 500MW Queensland solar farm in Haughton to be built over the next eight years. The Haughton Solar farm will be built by the Australian owned and operated Pacific Hydro, who have already built ~750MW of solar in Australia, Chile, and Brazil. Pacific Hydro, founded in Australia in 1992, also have a number of additional development projects with a potential capacity of 1.7GW. The Townsville Bulletin is reporting that the farm will be built on a 1,181 hectare plot of land in Upper Haughton, on Keith Venebales Road. It’ll create 240 jobs during construction an ongoing operation and maintenance will employ 10 further employees. It directly adjoins an existing 275kV Powerlink transmission line, so presumably it’ll connect directly to the National Electricity Market (NEM). No word yet on Power Purchase Agreements or if they’ll go the route of Eco Energy World and sell directly on the spot market. According to the Pacific Hydro website, the region has one of the highest levels of solar irradiance in Australia, with 2,095 KWh/m² per annum. 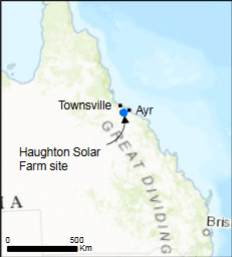 The 500MW farm, which will be built over three stages in the next eight years, will eventually product 500MW of PV solar and is a massive boon for the area and renewable energy in Queensland, which is seeing massive investment in the area of solar over the last few months. At full capacity, the Haughton Solar Farm is expected to generate enough solar power for around 170,000 homes. Burdekin Shire Council Mayor Lyn McLaughlin has noted that if won’t have an effect on the environmental aspect of the land: “If the solar farm becomes unviable or past its operational lifespan, the land can be converted back to agricultural land unencumbered.” McLaughlin noted that the approval is still subject to some conditions, such as upgrading of the road which will be used to access the project – but it looks like the project will go ahead without too much trouble. The solar farm, which will consist of 1,000,000 solar panels, should pass the tender process within the next couple of months and construction will commence early next year. Click here to view a project overview and location from the Pacific Hydro website. Bungala Solar Farm receives final approval.